South Park’s first episode of its 18th season is dedicated to founding a startup. 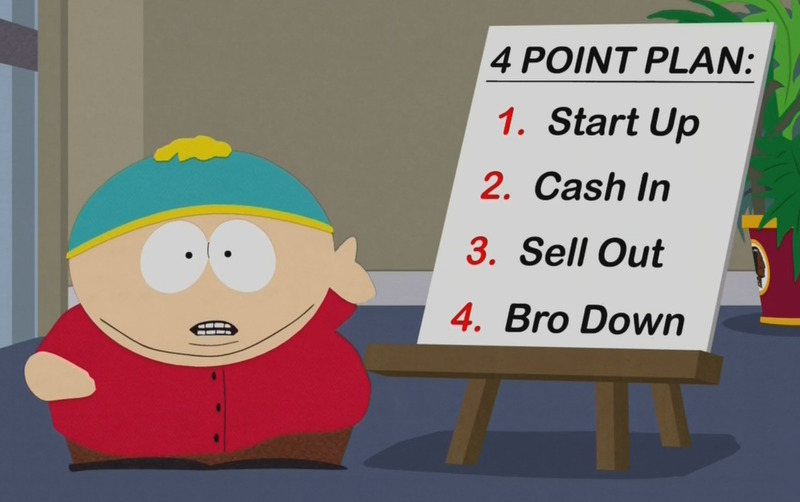 In the episode, Eric Cartman decides to found a company so he can do nothing for the rest of his life. He realises the trademark “Washington Redskins” has recently become available, and he uses the brand name to create a successful campaign on Kickstarter. “Washington Redskins” becomes infamous for its tagline, “F..k You,” and for being a startup that raised money for promising to do absolutely nothing in return. SPOILER ALERT: In the end, Kickstarter’s headquarters gets destroyed by the Washington Redskins football team. Cartman’s company pivots to become a Kickstarter rival that takes 5% of all successfully funded projects. This enables Cartman to continue running a company that collects money in return for doing no work. A mob of angry football fans then comes to Cartman’s office. The mob demands Cartman’s company shuts down. Cartman and his friends go back to school and give up the company.